Here are some questions and problems that people often encounter when using App Tamer. Before consulting this list or contacting us, please make sure you are using the latest release of App Tamer, version 2.4.4. 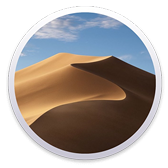 Is App Tamer compatible with macOS 10.14 Mojave? Which applications should I slow or stop with App Tamer? How do I turn on Time Machine acceleration and how does it work? App Tamer will not start up. It keeps saying it needs to install its helper application and asking me for the administrator password. Stopped applications don't wake up when I click on them in the Dock. What's wrong? When an application is paused, I get a spinning beachball cursor and the Dock says the app is not responding. How can I reduce App Tamer's CPU usage? App Tamer is waking all my apps every time I click the mouse. What's wrong and how do I fix it? App Tamer pauses an app that's using 10% of my CPU, but the overall CPU usage only drops by 5%. Why? What are App Tamer's default application settings? Yes, App Tamer version 2.4.1 or higher is fully compatible with Mojave. You can use App Tamer with just about any application. It comes pre-configured for many common ones. For those that it doesn't handle automatically, follow these guidelines. First, click on App Tamer in your menubar and see which applications are using CPU while they're idle in the background. Now consider what these applications do, and if they'll work just as well when slowed down or stopped. To change the settings for one of them, just click on it in the list. The Finder should usually be left running because it provides services to a lot of other applications. If an application performs a service without coming to the front, like Mail checking your email, you should slow but not stop it. If an application receives notifications, chat messages, tweets, or other data from the Internet without you doing anything, it should be slowed but not stopped. If an application floats windows above other windows to add features, as is done by Default Folder X, Drag Thing, or other UI utilities, they should be slowed but not be stopped. Also, their usability could be affected when they're slowed down. Experiment with different CPU limits. To choose a CPU percentage for slowing down an app, set it as low as possible while not impacting your work. Some, like Spotlight, need to be given enough CPU to get their jobs done, so you may have to experiment a bit. App Tamer comes pre-configured with good settings for many of these. Focus on applications that are using CPU when you don't want them to. And remember: if something "freezes" or doesn't work correctly, turn off App Tamer using its On/Off switch to see if the problem is due to an application being slowed or stopped. 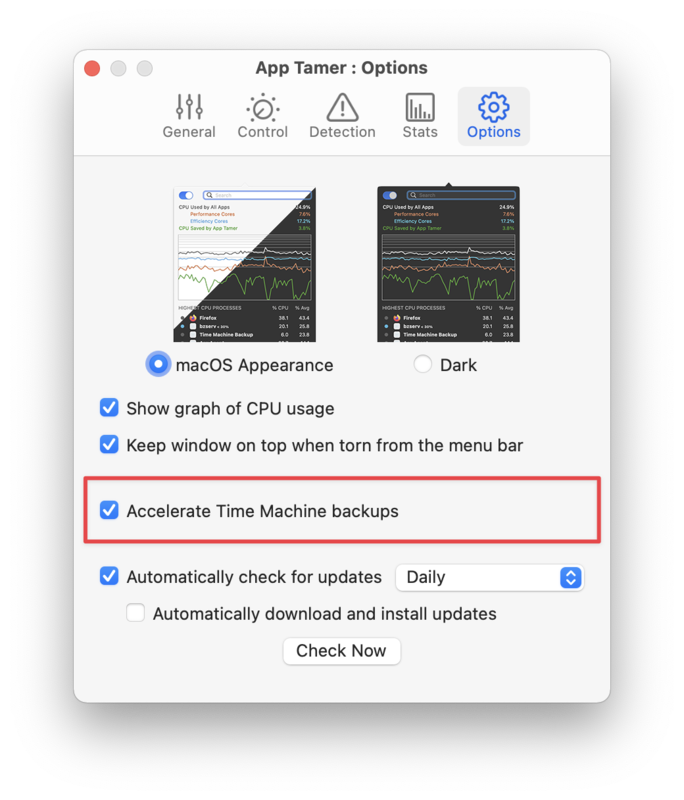 You can make Time Machine backups run faster by choosing App Tamer > Preferences > Options and turning on "Accelerate Time Machine backups". This changes a system parameter to allow Time Machine to run at full speed, rather than at the reduced I/O priority that it normally uses. Backups will complete much faster, but at the expense of taxing your Mac more, and possibly slowing down other applications that are running. Also, be aware that turning on this feature can make other background processes speed up, too. It prevents the system from throttling any processes that are marked for low priority disk access, so it may cause increased heat and reduced battery life when iCloud synchronization, App Store downloads, etc are running. For more information check out the articles at Mac Kung Fu and OSXDaily.com. What about macOS' App Nap feature? Apple knows a good thing when they see it. Mac OS 10.9 Mavericks introduced App Nap, a feature that 's similar to App Tamer. But to activate it you have to hide or completely cover an application's windows, making it not-so-automatic. And App Nap doesn't work at all with behind-the-scenes applications like Spotlight and Time Machine. App Tamer gives you control. If Spotlight is overheating your Mac and making the fans rev up like a fighter jet, for example, just select it and tell App Tamer to keep its CPU usage below 25%. If you want Chrome to use less CPU but still want to be able to glance at its windows in the background, just set its CPU limit to 2% with App Tamer. This happens when another application has installed a helper app into the folder "/Library/PrivilegedHelperTools/" and has given the folder the wrong security permissions. The easiest way to fix this is to download an AppleScript we've created called "Fix PrivilegedHelperTools permissions". You can get it by clicking here. Just unzip the script application, double-click it, and type your administrator password into the dialog box that comes up. After doing so, you should be able to launch App Tamer and install its helper application successfully. Some applications that modify the way the Dock works, like DockSpaces, do this intentionally to make the Dock reload its preferences. Because of this, DockSpaces and similar applications are incompatible with App Tamer. The Dock occasionally crashes because of a bug or corrupted data. If this has happened, restarting your Mac may fix things with App Tamer. If it was an isolated incident, you can just continue without giving it another thought. If it happens again, you'll have to figure out why the Dock is crashing and restarting on your Mac. Thanks to Rick Stahlhut for tracking this down! When an application is stopped, I get a spinning beachball cursor and the Dock says the app is not responding. This is normal - because App Tamer completely stops processes, they do not respond to macOS' checks to see if they're running. As a result, macOS will display its spinning beachball cursor when you move the mouse over a stopped application's windows. Unfortunately, there's not a practical way for App Tamer to prevent this. Rest assured, however, that if you click on a stopped application's window, App Tamer will wake it up and it will respond normally. Close App Tamer's window if it's open. Updating and sorting the process list accounts for most of App Tamer's CPU usage. Increase the CPU statistics update time to 10 or 15 seconds (instead of the default 5 seconds) in your App Tamer preferences. Click on App Tamer's icon in your menubar. Find the Dock in the process list. Control-click on the Dock and choose 'Quit' from the menu. The Dock should restart automatically. Quit App Tamer and launch it again. App Tamer has paused an app that's using 10% of my CPU, but the overall CPU usage on my Mac drops by 5%. Why? App Tamer's overall CPU graph displays the total for your entire computer. If your Mac has multiple CPU cores (as most do these days), there's a not a one-to-one correspondence between total CPU and per-application CPU usage. For example, stopping a process that's using 10% of one CPU will only result in a 5% reduction in the overall CPU consumption on a dual core machine.